I submit that if chemistry is the science of material change, then environmental historians—inherently interested in materialism—should pay especial attention to chemistry, chemicals, and their histories. And how chemical activity has profoundly altered the environment and human understandings of it. Banned rewards inquiries from a variety of different perspectives, and invites different interpretations from scholars of diverse backgrounds. As a result, it seemed appropriate to recruit reviewers who represented some coverage of this breadth. Inasmuch as disciplinary labels and backgrounds fail to adequately represent any scholar’s work, I asked David Hecht to examine Banned from his training in the history of science. Hecht also shares with Davis a research interest in Rachel Carson, which seemed to merit some interaction. Having shared a couple of panels with Rachel Rothschild in the recent past—and admiring her felicity at working seamlessly across environmental history, the history of science, and policy history—I was especially interested to get her perspective on Davis’s interpretations of toxicology at that intersection. Max Liboiron’s work offers a novel reading of the communication of risks and environmental action against invisible threats. Finally, Jody Roberts has been spearheading numerous science/environment/policy projects at the Chemical Heritage Foundation. His work on the Toxic Substances Control Act (which he notes below) offers an important lens through which to consider Banned. If you’re interested in the history of pesticides and toxicology, particularly if you are already somewhat versed in the field, I recommend Banned. It is a detail-oriented, close reading of key 20th century experiments, legislative hearings, events, and texts to investigate how scientific facts and legislative decisions about pesticides were made. While the book follows how toxicology became the gold standard discipline in the regulation of harmful chemicals, it pays equal attention to the roles of personalities, budgets, legislation, and labs in how chemical harm was defined. Davis isolates key moments—in experiments, health crises, and testimonies—where open concerns were settled, and different techniques and meanings of harm were solidified and naturalized through legislation– that is, it is a history of how policy made certain concepts and processes “normal,” even though they were contested at the time (and since). 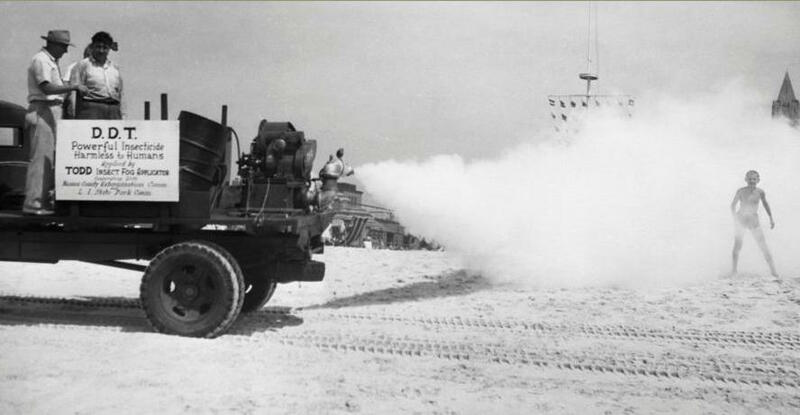 This research is important for scholars dealing with present-day topics in pesticides and other industrial toxicants because a history of how toxicity came to be understood at a particular time in reference to a specific chemical can help us denaturalize and un-normal theories of chemical harm and standards of evidence so we might better grapple with the threats posted by industrial chemicals today. A full PDF of reviews is here. H-Net permits the redistribution and reprinting of this work for nonprofit, educational purposes, with full and accurate attribution to the author, web location, date of publication, H-Environment, and H-Net: Humanities & Social Sciences Online. This entry was posted in Environment, Food, Government, history, science and scientists, toxicity. Bookmark the permalink.